At 22 years of age, I am going to be completely honest with you. The last coffee-type dessert I made lead to my realization that the word is ‘eSpresso’ and not ‘eXpresso’. I still can’t believe it. And every time I say the word I bounce back and forth in my prenunciation of an ‘x’ or ‘s’ sound—not that anyone is analyzing my every word. So needless to say, all of this was on my mind when I caught sight of these cookies. But the picture alone convinced me—these cute little crinkly things are irresistible. And their texture—that classic brownie flake on the outside, and an incredibly moist, fudgy center. 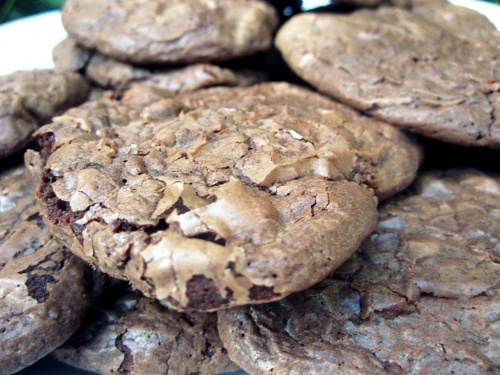 I think the key is that these aren’t typical chocolate cookies made with cocoa powder—they have a syrup of melted semi sweet and unsweet chocolate that, with a touch of coffee, made for a cookie much more grand and indulgent than the typical cookie. They went over great at work—lots of people claiming they were the best cookies I’ve made (granted, I am a cupcake girl myself so the competition probably wasn’t fierce). Let’s just say a glass of milk may be handy to have around—enjoy! Author Kyra KetnickPosted on September 8, 2011 February 1, 2019 Categories cookies, dessert1 Comment on oh fudge! I like fish. Whether it be a thick cut mahi mahi burger or fish sticks from the freezer. I like the light texture and flakiness of a nice piece of fish, but typically I fold and no matter what the seasoning or style, I reach for the mustard. I don’t know why it is, I think normally the seasoning is good but never enough and I don’t really eat fish for the, uh, fish flavor. That’s why this recipe tops the books for me for delicious fish recipes. The flavor is bold, it was really the most flavorful fish I’ve ever had. I also used thin filets of flounder so the fish to flavoring ratio was right on for me. So much so that I didn’t once reach for the mustard– a first for me. 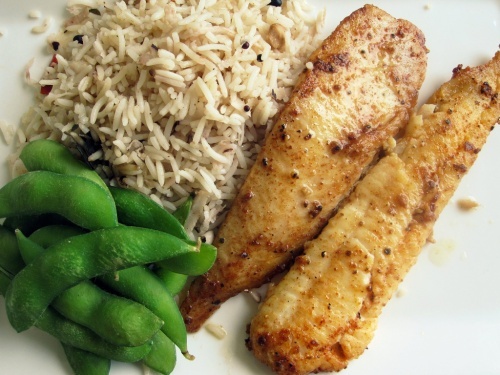 All the butter aside, it is a pretty healthy recipe, especially if paired with rice and edemame as pictured here. I can’t tell you enough—-this recipe will kick you in the mouth with flavor, which is a nice change for me since typically fish winds up…fishy. I have to admit that my favorite type of food is asian. I think its the tendency towards sweet, bold flavors and the wonderful taste of perfectly sticky white rice. There is a special place in my heart stomach for a plate of P.F. 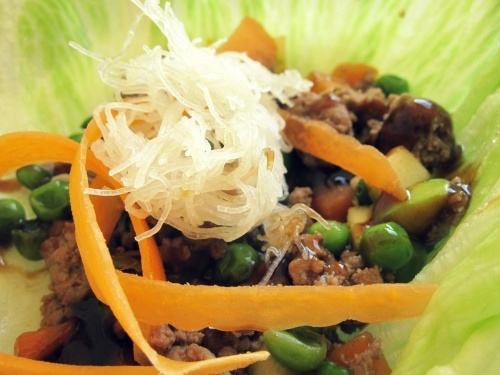 Changs lettuce wraps–food wrapped in…more food. The crisp crunch of lettuce is so refreshing contrasted against the savory sauce covered meats and veggies. And when I stumbled upon this recipe it took a minute to comprehend—my fancy-night-out, special occasion treat could be made in the comfort of my own home whenever I got the notion? A ground breaking thought, seeing as the nearest P.F. Changs is an hour and forty-five minutes away (lame). Don’t let the list of ingredients intimidate you—there are a few sauces that I know we definitely didn’t have on hand–but I have found them in many recipes and simply avoided making those due to my lack of asian food ingredients in stock. Maybe this recipe will spur you on to expanding your recipe possibilities to other asian delights—or a nice steak (that’d be the hoisen sauce).